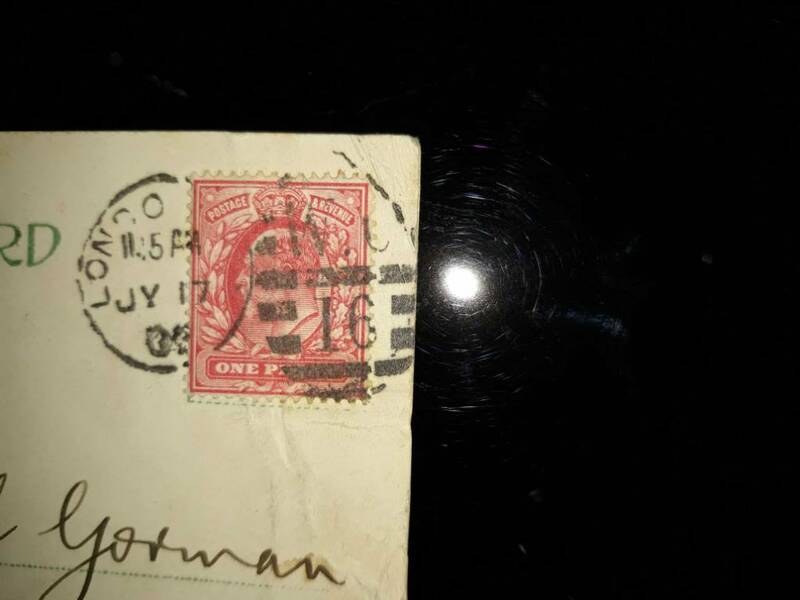 Good day, can anyone help with any info on this stamp. I think it's a King George VII. Has a London cancellation and WC 16. Hard to tell the year. Could be a 02. Any help would be great. It is also on a postcard. I don't collect GB, so I'm not much help. The color doesn't seem to match any of the entries in my Scott or Stanly Gibbons. It's King Edward VII from 1902-11 issue. Scott 128. Scott lists it as scarlet. There are shades. I have a used and mint and both are more on the red side than yours. This could be a colour changeling or just a very drastic colour shade. It might be the bright scarlet color shade, which is listed in Stanley Gibbon as #220, but not listed in Scott. In Stanley Gibbons, is priced the same as the scarlet stamp. Scott does list a GB #128h (rose carmine) which is listed in the SG GB Specialised, but I don't think your stamp is that color shade. Keep in mind, IDing these color shades on a computer monitor isn't reliable without a reference color shade stamp in the same picture. 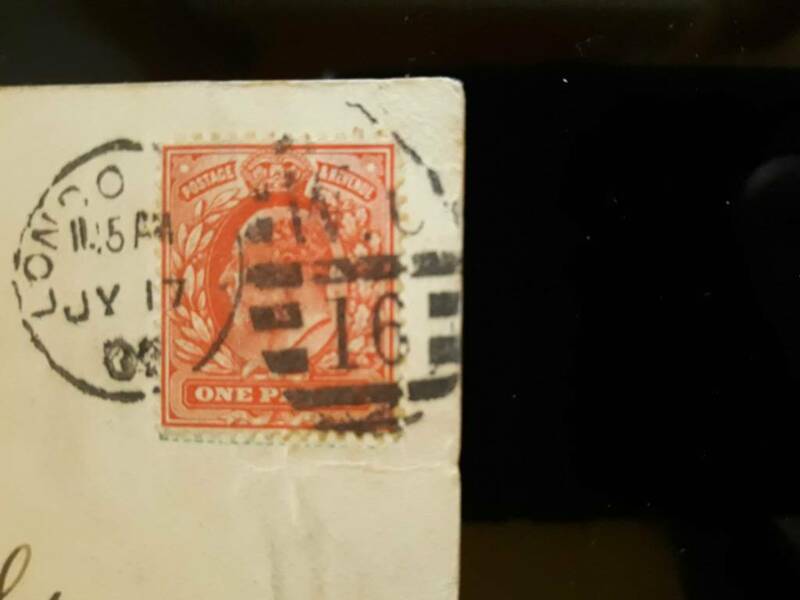 The year on the postmark does appear to be 02 (i.e., 1902). I pulled out some of the club stamps to see what sort of variations were common. Frankly they were all pretty darn uniform in color, not even close to what you have. I added some Scott 160 stamps to the bottom row, which are also called scarlet, though obviously of a different shade(more like yours). Maybe you could show a pic alongside of a color chart or a normal 128. A fun step would be to take a normal stamp and subject it to some fumes and see what happens. Now that looks much closer to the ones I have. The first time it looked orange or vermillion. Now it looks more scarlet as Scott describes it. Your second pic looks like the normal scarlet on my screen. When taking camera pics, it needs to be done in "natural" light (i.e., closest equivalent to sunlight).